Schools are popular targets of those who wish to find a scapegoat for every societal ill from a sour economy to the pitiful season the Dallas Cowboys put us through this year. I believe we are part of the problem, because we don’t do enough to shout about our successes from every rooftop in every community. While I don’t pretend all schools are equally successful, neither are they equal failures. The budget crisis looming for Texas and for its schools, in particular, has heightened my own awareness of the need to become self-promoters. I intend to devote more time than ever before in sharing the ways that our schools are using technology to engage students like never before and to give them opportunities to learn in a real way, infused with 21st century tools and skills. Our communities and leaders need to see how amazing things are happening, not just the negative, isolated events that make our newscasts. In the spirit of this resolution, I wanted to share some of the ways that Web 2.0 technologies have had a powerful impact on our students, teachers, and schools in Birdville. It has been just 4 short years since I had the opportunity to share my vision for Web 2.0 with our district’s leadership team. 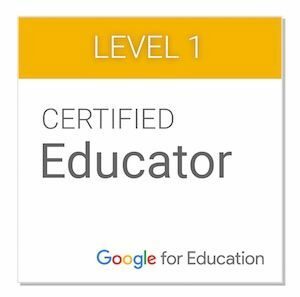 It has exceeded my expectations in many ways, and is the most gratifying thing I’ve been a part of as an instructional technology specialist. It has not only made learning more relevant and engaging. It has also thrust our district into the national spotlight, as we have been cited for our progressive stance toward use of the vast Internet resources available. We have been assembling a slide show that highlights how tools such as YouTube, Glogster, Google Docs, Xtranormal, Facebook, Twitter, blogs, wikis, podcasts, Skype, and many more are being put to powerful use in the district. The show is embedded below, or is alternately viewable here. More examples will be added in the coming weeks. I hope they might provide some inspiration for teachers looking for ways to use the technologies in the curriculum. I’ve updated my introduction to Web 2.0 handout and wanted to share it here. Feel free to download, modify, and use it as you see fit. The 2008-2009 school year saw some exciting developments in the use of technology in Birdville schools, and there are increasing signs that many teachers and administrators here no longer view technology as an exciting addition, but as a critical necessity. Among other trends, the district witnessed explosive growth in the number of students enrolled in online courses. A new digital media system will make storing and retrieval of digital content faster and accessible from any Internet-connected computer. Video is gaining momentum rapidly, as more campuses add webcams and small, portable video cameras to the arsenals of teachers and students. Web 2.0 tools also continue their steady infiltration of the day-to-day activities of students, teachers, and administrators. Our department launched a very successful program to educate administrators on a wide variety of educational technologies this year. Called Lunch and Learn, the program offered short (1 hour) introductions to technology over a gourmet lunch (usually pizza). The response was very positive, and plans are under way to continue the program next year. The 12 Second Tech Challenge was started on a whim as an effort to encourage reluctant teachers to try new tools in short bursts. I offered the challenges (and possible prizes, such as web cams, graphics tablets, wireless presenter mice, etc.) to my own campuses, and I received excellent participation and feedback asking for more. I am hopeful that the project will be a district-wide offering next year. Numerous Web 2.0 tools have gained a significant foothold in the teaching practices of our district campuses. Blogging and wikis continue to have a significant impact. Two campuses, for instance, established student news sites using Edublogs. Students published researched stories, conducted interviews, reported on school events, and incorporated videos of campus events. Twitter is beginning to be utilized in exciting ways. As examples, a middle school teacher (Twitter name foxworth) utilized the tool to communicate news and course information to students and parents. Several campuses, such as Birdville High School and Holiday Heights Elementary, are using Twitter to broadcast campus events and announcements to parents and the community. Ustream was used by the technology department, campuses, and several teachers to stream class and district events, training, and more. The availability of YouTube in the district let teachers and students access powerful educational videos and, even more exciting, to create and share their own work with a global audience. Communication tools, such as Skype, Dimdim, and Mebeam allowed classes to collaborate with other students in distant locations and teachers to attend training (see below) from the comfort of their classrooms. Student creativity was encouraged through the use of online tools such as Glogster, Animoto, and VoiceThread. Online office applications began to be utilized, with tools such as Google Forms showing particular promise for conducting surveys, gathering data, assessing student progress, etc. The online quiz tool MyStudiyo gained a following among teachers who incorporated the interactive products into class websites and blogs. The list could certainly go on, but this gives a good, general view of some of the exciting ways teachers and administrators have taken to the use of Web-based instructional tools in the district. Were I to create a “grade” for our progress, I’d give us a solid B+. Our faculties are showing tremendous creativity and enthusiasm, but the utilization of technology needs to see continued growth in the coming year. Far too many of our classrooms are still the domain of well-intended but out-dated practices, resources, and curriculums. The encouraging thing to witness is the fire that is spreading from small sparks of innovation, and the potential exists for a blaze of 21st Century teaching and learning to engulf the classrooms of our district. Too Much to Moodle to Ignore? As an advocate of free, online Web 2.0 tools, I have spent a great deal of time and effort in reading and researching, trying to keep up with the latest, greatest sites for my teachers or presentation attendees to use to transform their curriculums into the 21st century. I must admit that I’ve been neglectful of some other areas of technology, not so much because I failed to see their importance, but rather that the read/write Web has simply captured my imagination. One particular tool that I wish to gain a greater familiarity with is Moodle. Moodle is a learning management system (LMS), defined by Leonard Greenberg as “a high-level, strategic solution for planning, delivering and managing all learning events within an organization.” (2002) Among other things, Moodle is a powerful tool for creating online content and e-learning opportunities. It has become an amazing force in the education world. It is a free, open-source tool that is putting a serious dent in the sales of for-profit tools in the field, especially in the current economic climate. Miguel Guhlin is one of the foremost advocates of Moodle in education in the state of Texas today. In his blog and numerous trade publications, Miguel offers insights into implentation of Moodle, its applications, and justifications for its use. In an article written for the magazine On Cue and cross-posted in his blog this week, Miguel gives a good, general overview of the tool and some suggestions for its implementation. One thing that caught my eye was that “Moodle comes replete with blogs, forums, RSS feeds, wikis and more that enable it to be seen as an “absolute good” that opens the door, that enables powerful ideas to slay the fears our IMHO – slay the fears that leaders hold.” I’ve been told many, many times that schools cannot utilize the tools I’ve shared because of restrictive filtering policies, so if Moodle is a step to overcoming this, I’m definitely listening. Miguel does a great job going into more detail on some of the applications of Moodle in education, but I’ll summarize briefly what he describes. Online learning environments. Users can create and utilize online groups, such as literature circles, create online quizzes and other instructional resources, build wikis for group collaboration, display student work, keep writing journals, develop online lessons, and more. District/campus communications. Leaders can create book studies, disseminate news, engage staff in discussions using online forums, etc. All of this can be created in a private setting, accessible only to invited members. Supporting district initiatives. Moodle’s discussion forums, questionnaires, and synchronous tools (Such as a Dimdim module!) help schools and districts implement initiatives in a manner that is on-going and as needed, rather than the typical isolated and infrequent way that it too often is presented. Professional development. Moodle has the ability to make professional learning opportunities an anytime, anywhere affair. Teachers can login, take a course, complete a questionnaire, share a lesson plan, and earn needed professional development credits, such as ESL or G/T hours. All of this accomplished in a format that is both cost-effective (no transportation expenses) and fits into already busy schedules. Take the time to list the reasons you need the tools. Share the reasons with administrators. Create a petition and enlist the support of like-minded educators. Explain the need for a person to be the administrator of the computers on which the tools will be used and volunteer to be that person. Cultivate a relationship with the people in “power” over technology and access to resources. Do your research. Administrators generally love data. Be able to support your ideas with evidence. Educate the leaders at the top of the hierarchy. Show what other schools are doing. Teach them the tools and encourage them to try them out. I know from experience how powerful this can be. Emphasize the cost-effectiveness of your ideas. The tools are free, but will require some costs in terms of servers, support, etc. Regardless, they are certainly more efficient than many pay-for-use tools. If those in charge are reluctant, emphasize the ability to create resources whose use and access is totally controlled by the school/district. I plan to be experimenting with the tool in the coming months, and I will be sharing my thoughts and experiences here. In the meantime, if anyone is curious enough, you can learn a great deal through Miguel’s writings on his blog and elsewhere. I’ve also found him to be very willing to offer insights and answer questions through Twitter (http://twitter.com/mguhlin). Additionally, Moodle has a very active community of users, and you can tap into this community through the Moodle forums at http://moodle.org/login/index.php. WetPaint wiki–This serves as Josh’s class website and hub of student information. The wiki includes curriculum information, assignments, student video projects, external links, videos for reviewing concepts, class materials, discussion threads, and more. YouTube channel–One of the coolest things about the resources Josh has made available to his students is that most were created by either Josh himself or his students. 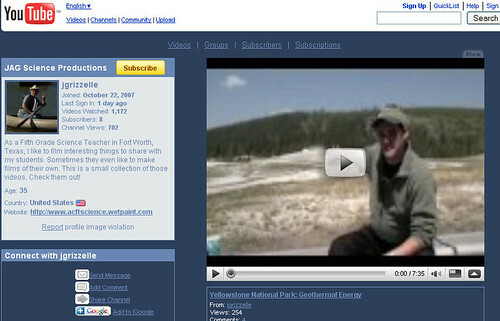 On his YouTube channel, visitors can see examples where Josh took advantage of opportunities such as a lizard he encountered locally, a trip to Yellowstone, or an expedition to the Big Bend area of south Texas. Rather than letting such events pass by, he used a video camera to create a teaching tool, passing on knowledge to his students as he learned it. Student videos–Assessment is, of course, an ever-present reality. In our district, focuses on programs such as Continuous Improvement place even greater (excessive might be more accurate) emphasis on assessment. Students can grow numb to the repetitive pre-testing, formative testing, and post-testing. In Mr. Grizzelle’s classroom, students are given the opportunity to forego the paper-and-pencil drill each six weeks period. Rather, they create videos to demonstrate their understanding of key concepts. The videos are hosted on Josh’s YouTube channel and embedded into his class wiki. Josh’s students are applying and gaining many critical, 21st century skills, including media literacy, creativity, collaboration, communication, initiative/self-direction, etc. They are also very likely to be much more motivated to create and use technology-rich, real-world products, as opposed to the resigned compliance so typical of many students being force-fed traditional curriculums, assignments, and assessments. The level of technical ability required to do the things Josh is doing is relatively small, by the way. The main commitment is the time it takes to do initial setup (of the wiki and YouTube channel), ongoing maintenance (similar to writing lesson plans, creating materials, etc. ), and some time to edit/publish video projects. The payoffs include engaged, highly-achieving students and a wealth of resources available 24/7.